I have always wanted to see Aurora Borealis (Northern Lights) and I never managed to see it the five years I lived in Norway. The Aurora is caused by the collision of energetic particles coming from the Sun with the atmosphere. Their typical green colour comes from the interaction of the particles with Oxygen atoms in the atmosphere. The auroral mechanism is better explained on Wikipedia. Because the particles are charged, they are directed towards the magnetic poles of the Earth. Aurora gets more intense, and is visible on lower latitudes, when a geomagnetic storm is in progress. One of their causes is a coronal mass ejection (CME) on the Sun which sends huge quantities of matter and electromagnetic radiation out into space. When CMEs are directed towards Earth they cause a geomagnetic storm which increases the change of Aurora Borealis to occur. The solar cycle, which is eleven years is a cycle in which the Sun's activity goes from very little activity to a lot of activity and back to very little. During solar maximum there is a lot higher chance of a CME to occur. Originally the most recent solar maximum was forecasted to be in 2010 or 2011 but more recent predictions expect it to be this autumn. For some unexpected reason, Auroras are strongest around the vernal and autumnal equinoxes. Aurora Timelapse, near Vogar, Iceland on March 17th. This timelapse shows the auroras over a three minute period with a picture taken every 5 seconds. At a frame rate of 3 frames per second this is sped up 15 times. The show lasted until about midnight, when we headed back to Reykjavik. Some more still photos are available on flickr. 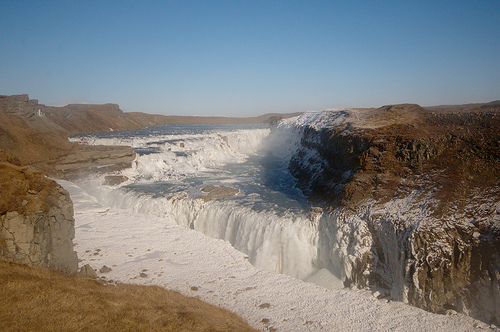 Of course, Iceland has much more to offer than just the occasional show of Auroras and the next morning we set off on the Golden Circle—a trip past Iceland's touristic highlights. Our first stop was Þingvellir, the site of Alþingi, the first Icelandic parliament that was founded in 930. 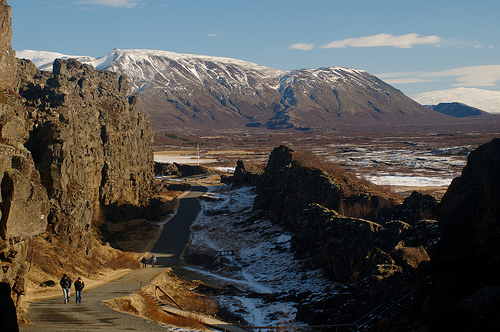 It is situated in a rift valley that marks the crest of the Mid-Atlantic Ridge and is part of Þingvellir National Park. After Þingvellir we proceeded to the geyser Strokkur (Icelandic for "churn"). It's quite spectacular to see a whole lot of water being launched in the air every 4 to 8 minutes. The last day of the trip consisted of exploring the Rejkjanes peninsula which is a large geothermic area. 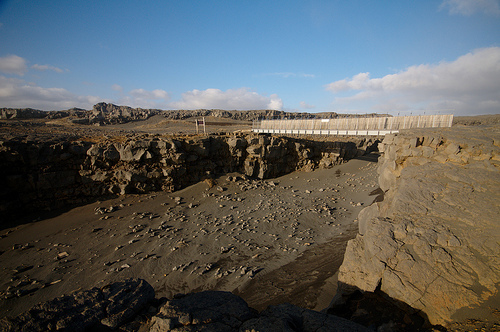 We visited the Kerið crater, the geothermal fields Seltún and Gunnuhver, the cliffs near Reykjanestá and the "Bridge between two continents". The colours of some of the landscapes were beautiful, but there was a strong cold wind almost everywhere which made us want to go to the car very fast most of the time. Something to re-explore in summer I suppose. After a good night's dinner, drinks and rest we spend the last morning of our trip with our bottoms in the Blue Lagoon to relax. A perfect ending to a quick, but gorgeous trip in Iceland. We'll be back! For further photos and timelapses, please see my flickr set.